Location: At NW end of Westgate Street. Dated 1835. Ornately moulded cast iron mile-post in Gothic style, the first of a series on the A48 to the west of Cardiff. 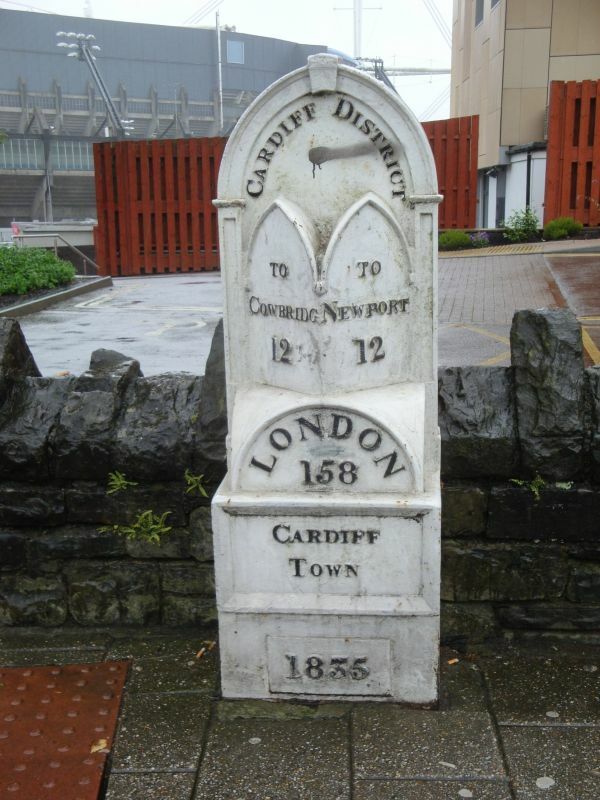 Rectangular panels at the base, the lower one with date "1835", and the upper one with the words "Cardiff Town". Behind and above this, a tall crowning tablet with curved head, inscribed "Cardiff District". Two pointed headed panels protrude from lower part of this tablet, the left hand one inscribed "To Cowbridge 12" and the right hand one inscribed "To Newport 12". A segmental panel inscribed "London 158" below these and above rectangular panels at base. Fine piece of early C19 cast iron work. At S entrance to Bute Park. Between SW angle of Castle and West Lodge. Between Grand Hotel and Angel Hotel. This bridge forms the main exit from the historic city of Cardiff to the west and is situated about 200m west of Cardiff Castle. Opposite Castle Court, about 100 m SE of junction with Castle Street.